My New Year’s resolution for 2018 was to do a piece of trackable activity everyday. I normally don’t go for such resolutions but having had serious injuries in the previous two years and with my fitness declining and my weight ballooning out to the heaviest I’ve ever been meant I had to take action. I will write a series of posts reflecting on this experience, most likely over the holiday break when I have more time. It was worth a post today however as November 30, 2017, was when I weighed myself and I was shocked to see I weighed 134kg. So using body mass as a crude measure, a year later where am I? 117.5kg. 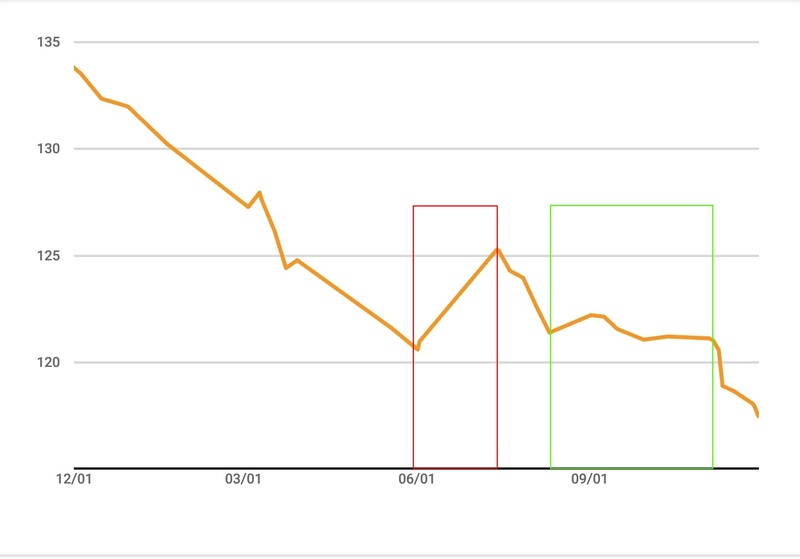 The below graph is an edited version of the one available via MyFitnessPal (Android app). It is possible to see how the different periods of the year impact my weight. I’ve highlighted two periods. The big decline in the first half the year was managed by gradually increasing my activity levels. I began by commuting on our e-bike and gradually stepped up the daily activity. I was sensible and did not try to do too much at once. I compared the rate of weight loss to the level of activity in previous years to get a better sense of what was sustainable. The red box is when I had a week of conferences in New Zealand followed by a month of sickness in my household. Plus it is in the depths of Canberra’s winter. This is when doing exercise was hard and I managed to do at least 20 minutes on the stationary bike everyday. The green box largely coincides with second semester (at university where I work). Work was extremely busy this semester, more so than last year when I went for promotion! For Q3 I worked towards riding in Fitz’s Challenge (tough 105km sportive), which was at the end of October. Since the end of October I’ve stepped up the intensity again. I’ve started erging again (indoor rowing, on the Concept 2) almost every morning as well as commuting and tracking everything I eat through MyFitnessPal. When I hurt my back in 2014 it was from doing too much on the ergt, so I wanted to wait until I had completed Fitz’s. In November I’ve working on around losing 1-1.5kg per week. My first goal is 109kg. ([cough] The maximum weight for the carbon wheels I want [cough].) I’d like to get there my Big Canberra Bike Ride in March. My ultimate goal is sub-100kg, so I have at last another few months of work to go. My 2019 New Year’s resolution is primarily erg-related and aiming to do a marathon distance and a sub-6:30 2km, while doing a piece of trackable activity each day. I’m going to delve into my Strava data at the end of the year in part 2 of this post.